In my last post I mentioned how amazed I was at how much the weather affects operations at the lighthouse. Last week I was amazed yet again. After having an abnormally cool beginning to summer, we had several days that were abnormally hot. In fact, we had to close tours into the tower of the lighthouse because of the heat. The top of the tower is enclosed with glass and works like a greenhouse trapping in the heat. It was not safe for people to climb up there, let alone have one of our guest keepers stay in the tower for an extended period of time. This last week also brought the complication of a week without guest keepers. Generally we have two guest keepers, but the keepers who were scheduled were unable to make it to the lighthouse so we had to try to cover tours by ourselves with some help from last minute volunteers. Because of this, I was in the lighthouse almost full time last weekend. I love giving tours and I had a lot of fun because we have been having more families with young kids come to the lighthouse. I love showing the kids how items like our Victrola record player work. By the end of the day my voice was sore from talking so much, but it was a very good weekend. Over the last couple of days, I have also been helping get ready for Christmas in July. I helped to decorate the lighthouse and I worked our big Christmas in July ornament sale. It is interesting the reactions people have to Christmas in July. Some people are very excited about it, and others are confused. We even had a couple of people who were upset because it was too early to start seeing Christmas trees. Generally people relaxed when we explained that it was Christmas in July. The Christmas in July ornament sale was today and went very well. We had a tent with table set up outside the lighthouse and I worked out there all day writing up tickets for customers to take into the gift shop were they paid. This sale allowed us to sell a lot of the ornaments that were taking up storage room in the gift shop attic and we also sold ornaments that were brought from the Lansing store. Having events every couple of weeks really brakes up the routine of the lighthouse and makes it more fun. My daily work at the lighthouse just began to fall into a routine when one of my coworkers told me to brace myself because “July is a different beast.” She was right. With the first week of July came Fourth of July weekend and the first truly warm week of the summer. The lighthouse finally started to get busy and we had several days over the Fourth of July weekend where we gave over two hundred tours. In addition to the lighthouse being busier, the beach near the lighthouse was also busier meaning that we had to patrol the parking lot more often. Because the lighthouse is in a state park, each vehicle needs to have a state park pass to be in the parking lot. Recently, Michigan started allowing vehicle owners to pay for a year pass when they renew the tabs on their license. If they chose this option, a small “p” is printed on their tabs. If not, visitors to the park must purchase a pass at the contact station at the entrance to the park. The day use area at the park is near the lighthouse, so several times a day, we have to check the parking lot to ensure that everyone has paid the fee. Last week, I patrolled the parking lot for the first time. Despite the warm Fourth of July weekend, there were thunderstorms in the area last Monday and Tuesday. While it was not the first time it rained when I was at the lighthouse, it was the first time there was lightning while I was working. When there is lightning at the lighthouse, we have to evacuate everyone from the tower and tours are not allowed up until fifteen minutes after the last lightning strike (which reminded me a lot of baseball). Monday, I was at the lighthouse with the guest keepers when we saw lightning. While the one keeper evacuated the tower, the other keeper and I brought the flag in before the rain started falling. The keeper took the flag into the lighthouse, but I had to check the gift shop before helping her fold the flag. On my way back from the gift shop the sky opened up and it began pouring. I was drenched and it took me almost five hours until I was completely dry again – luckily the day was warm. We had few visitors on Monday and Tuesday because of the weather. I have be absolutely amazed at how much influence the weather has on attendance at the lighthouse. After several weeks of working at the lighthouse, and a couple of vague references to guest keepers in past posts, I think it is time that I explain about this program more fully. The guest keepers at Tawas Point Lighthouse pay $250 a person to stay in the lighthouse for a week. During that week they give tours from noon until 6:00 every day but Tuesdays. The keepers’ week lasts from Friday to Friday. Guest keepers need to apply to stay at the lighthouse and the program is very popular. In fact, all of the spots for 2013 are filled and we have already begun taking applications for the 2014 season. The guest keepers play an important role in the way that the lighthouse operates and each keeper brings something different to the table. Last week, our guest keeper was very interested in navigation and had been a member of the cost guard, so when he talked to guests he emphasized the importance of lighthouses in navigation. Other keepers have focused on other areas that interest them, such as lighthouse construction or the tasks the lighthouse keepers performed. In addition, this particular keeper was very interested in the Big Storm of 1913. This large November gale struck the great lakes a century ago and wrecked hundreds of ships. Twelve ships (plus their crew) disappeared completely and were never heard from again. Even with modern technology, three of these have still not been found. 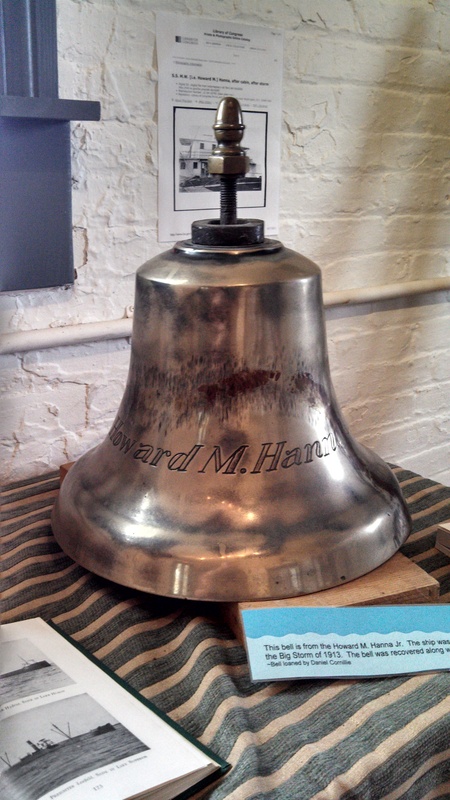 When the keeper came, he brought a bell from the Howard M. Hanna, one of the ships that was wrecked in the storm. While he was there, we were able to display this bell in the lighthouse and I created a small exhibit around this artifact. This bell is off the Howard M. Hanna Jr. a ship that was wrecked during the big storm of 1913. Keepers who are very interested in the lighthouse and connect their interests make visiting the lighthouse a different experience for return visitors. I know that I have learned a lot from our guest keepers. An explanation of the guest keeper program wouldn’t be complete without a mention of some of the difficulties that this program can create. As great as most of the guest keepers we have had are, there are some keepers who have not been prepared when they come or who were unable to make the orientation this spring. Because the guest keepers arrive about two hours before they begin giving tours, if the keepers have not prepared learning all of the necessary information can be overwhelming. We try to make things less stressful by being in radio contact with the keepers so that they are able to ask questions at any time and generally there is someone who can go and help out in the lighthouse when the lighthouse gets busy. I really enjoy working with the guest keepers. It is great to work with new people each week. I have learned something from every guest keeper we have had. I’m excited to meet the rest of our guest keepers as the summer continues. Much of my time this past week has been spent in the gift shop and due to unseasonably cold weather, visitation is still slow. Monday, however, was very busy. A group of ninety second graders visited the lighthouse on a field trip. This was the highlight of my week. Because there were so many guests all at once, the children were divided into four groups (this worked out well since there were four classes). One class was in the lighthouse, one class was in the gift shop getting an ice cream treat, one class learned about area wildlife, and the final group were able to polish Petoskey stones. I was in charge of the Petoskey stone station. First, I told the second graders about Petoskey stones (they are the Michigan state fossil, and are fossils of coral that grew in this area over 350 million years ago when Michigan was covered in salt water). Then, each student received a Petoskey stone and used a Q-Tip to polish it with mineral oil. It was very fun to see their reactions when the pattern was revealed – there were many ooooooh’s and aaaaaah’s. The most interesting thing that I learned from leading this center is that sometimes doing things the most efficient way is not a good goal. It takes a lot longer for a group of students to go through the lighthouse than it does for the same group to polish Petoskey stones. So, instead of asking the chaperons to help pass out supplies, I was instructed to pass out things out one at a time because that takes longer. Also, instead of having a trash can nearby, the kids had to walk a short distance to throw their trash away. This tactic worked well because while every group finished before the lighthouse was ready for them, they did not finish so early that they were bored. The other highlight of my week was the small amount of collections work I did. A visitor to the lighthouse noticed that there were not very many books in the bookshelf in our 1939 living room, so this visitor donated a box of old books. I went through the books, made sure that they were all period, and wrote down the publication information to be entered into the museum database at a later time (the lighthouse doesn’t have internet, so records have to be entered at the main office). While I was going through the box, I was very excited to discover that the original Nancy Drew books were period. This was one of my favorite series when I was younger and there are now three of them in the bookshelf at the lighthouse. 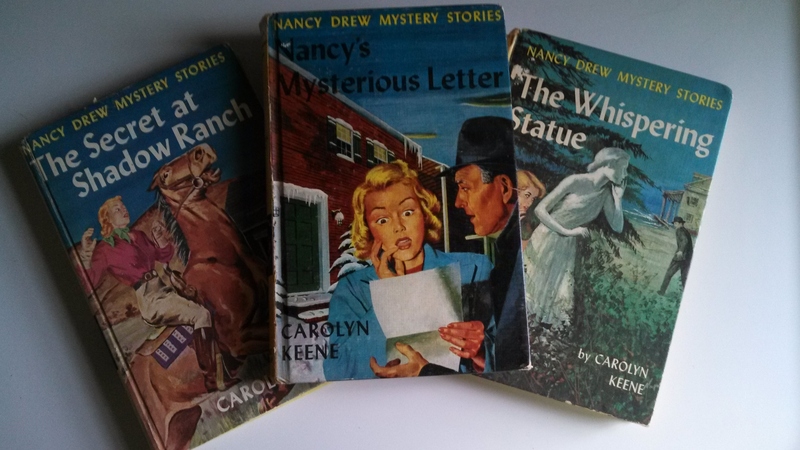 Three Nancy Drew Books were donated for the 1939 living room! I’m also very excited for this weekend, because it is Celebration Days at Tawas Point Lighthouse. 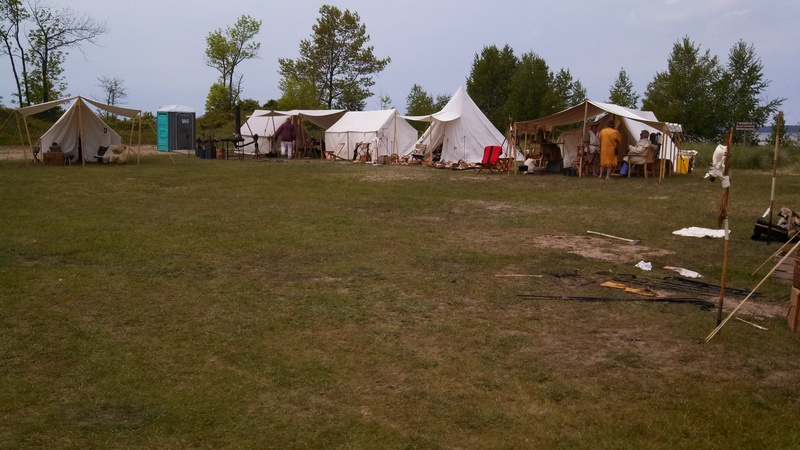 This is the lighthouse’s largest festival of the summer and all different kinds of reenactment groups, craftspeople, and vendors will be camping at the lighthouse.